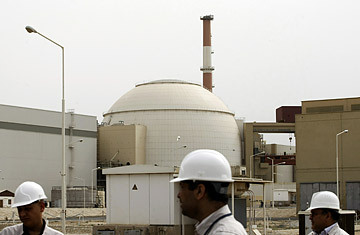 Iranian technicians walk outside the building that houses the Bushehr nuclear power plant's reactor, in the Iranian port town of Bushehr. Is the U.S. Pursuing the Wrong Mideast Peace Process? Iran War Rhetoric: A Self-Fulfilling Prophecy? Despite the media hysteria over a supposed drumbeat for war with Iran, the White House is not unduly worried by the news that Russia will, on Saturday, begin loading enriched uranium into Iran's Bushehr nuclear reactor. While former Bush Ambassador to the UN and Fox News favorite John Bolton breathlessly warned Monday that Israel has just five days within which to bomb the reactor  after which an air strike would risk killing many thousands of civilians from a radiation leak  the Obama Administration has been more sanguine on the Bushehr news. To Administration critics, the move to bring Iran's atomic energy plant online makes clear that Iran is not nearly as isolated by sanctions as Washington would like. But that misses the point, since Bushehr is actually exempt from those sanctions because it represents no nuclear weapons threat. And the Administration is moving to tamp down the hysteria being fomented by the likes of Bolton, reportedly making clear to the Israelis that the minimum time frame Iran would need to build a nuclear weapon, after declaring their intent by kicking out inspectors, is one year  plenty of time in which to take dramatic action. Instead of prompting confrontation, the move to bring Bushehr online will be used by the Administration to argue that it demonstrates Western readiness to accept a Iranian nuclear energy program without uranium enrichment. The uranium that will power the Bushehr reactor is imported from Russia, while the reactor's spent fuel  from which Iran could hypothetically extract plutonium if it had the technology to do so, and if it weren't under the scrutiny of IAEA inspectors  will be removed from Iran by the Russians. And the fact that Bushehr will produce electricity with Russian-supplied uranium, says White House spokesman Robert Gibbs, "underscores that Iran does not need its own enrichment capability if its intentions, as it states, are for a peaceful nuclear program." In other words, the U.S. believes that Iran's determination to enrich its own uranium calls into question its stated motives; like other Western powers, Washington fears that the enrichment activities, some of them initially conducted in secret, could service a clandestine bomb program. But that's not how the Iranians see it. For them, the fact that Russia says it will finally fuel the reactor after some 14 years of dragging its feet on the project is only proof that, as Mohammad Ahmadian, head of Iran's Nuclear Power Plants Production and Development Company, indelicately put it, "Western countries cannot be trusted." Tehran believes the Russians used Bushehr for political leverage to press Iran to comply with Western demands, and see the project as an object lesson in why they can't allow their nuclear program to be dependent for reactor fuel on the kindness of strangers. Iran has always insisted on its right, as a signatory to the Nuclear Non-Proliferation Treaty, to enrich uranium for energy purposes, and maintained that its purposes are peaceful. But enrichment does put bomb-making capability closer within reach for Tehran, and Iran has been ordered by the UN Security Council to suspend its enrichment until all issues of disclosure and transparency raised by the IAEA can be resolved. Iran, however, has made clear it is planning to expand its enrichment capacity (although Western intelligence believes it has encountered technical problems). Bushehr coming online, then, is unlikely to alter the standoff over Iran's nuclear efforts either way. Sanctions adopted by the Security Council and a raft of new measures imposed by the U.S. and Europe aimed at stopping third countries trading with Iran have certainly had some impact in Iran, but most analysts still believe economic pressure is unlikely to change Iran's calculations. Iranian opposition leader Mehdi Karroubi this week warned that the sanctions are actually strengthening the hand of the hardline Republican Guard Corps because of their central role in sanctions-busting economic networks, and by creating an external excuse for economic hardship. The improbability of sanctions breaking the stalemate has led to a flurry of media speculation over the possibility of Israel bombing Iran's nuclear facilities as early as next spring if the U.S.  as most expect  is reluctant to do so. Such speculation, however, tends to be based mostly on the apocalyptic rhetoric of Israeli politicians who frequently invoke Holocaust imagery in referring to Iran's enrichment activities, rather than on the more sober assessments of its security establishment. Whereas Netanyahu likes to tell Western audiences that Iran is led by an irrational "messianic cult", that view is not shared by Israeli military and intelligence analysts, according to Yossi Alpher, a Mossad veteran and former adviser to Israel's Defense Minister, Ehud Barak. Alpher argues that in light of the potentially catastrophic consequences, Israel would only take military action if Iran was in a position to launch a nuclear attack on the Jewish State in an "extremely short" time frame  and that a strike could set back the Iranian program for a significant period of time. And the fact is Iran is nowhere close to the ability to attack Israel with nuclear weapons. The U.S. intelligence consensus holds that while Iran is developing the infrastructure necessary to create a bomb and also doing theoretical research on bomb design, it is not currently developing nuclear weapons nor has it made the decision to do so. Its goal is generally viewed as "breakout" capacity, i.e. the ability to build a bomb relatively quickly if it chose to do so  and even that capacity still appears to be some way off. In explaining the peril they see in the Iranian program, Israeli leaders tend to accept that even an Iran armed with nuclear weapons is unlikely to initiate a nuclear exchange that would be suicidal for Tehran given the size of Israel's own nuclear deterrent. Instead, they warn that an Iranian bomb's primary impact would be to end Israel's strategic dominance in the regional balance of power, which would in turn embolden Israel's insurgent neighbors such as Hamas and Hizballah. Right now, the war talk may be designed primarily to stiffen the spine of Western policy makers on sanctions and diplomacy, by invoking an alternative too ghastly to contemplate. Both sides know that rather than imminent military action, the next phase of the Iran standoff is likely to be a renewed round of talks with Iran. The U.S. and its allies hope to use the leverage of sanctions to persuade Iran to back down, while Iran will look to make smaller concessions, especially in areas where they have upped the ante, such as enriching uranium to 20%, which takes them a lot closer to the technological capacity to create bomb-grade materiel. For each side, the long game remains shaping the diplomatic compromise to their own liking.